These dreamy cups have a few steps, but a freezer can help speed up the process considerably. My kids made these for me, so I know your kids can, too. A bit of adult supervision would be a good thing, though… The counter and stovetop were quite a chocolaty mess at the end. Melt half the chocolate either in a double boiler or in the microwave. While melting, set out a 12-cup mini muffin tin on a tray and line with cupcake papers. (You can cover with parchment paper to avoid a mess.) Pour the melted chocolate into a measuring cup with a spout and pour into the muffin tins, dividing evenly among all 12 cups. (More sophisticated bakers can take a small paintbrush and paint the chocolate up the sides of the cup, if you enjoy a challenge, but it will taste good and work without this step as well.) Place in freezer until it sets, or just wait patiently. In a glass measuring cup or bowl, place the peanut butter, confectioners’ sugar, and salt. Mix well. Heat in the microwave for one minute to make it soft enough to pour. Meanwhile, place the rice krispies in a small bag and crush gently, so that they break, but don’t become crumbs. Add the crushed rice krispies to the runny peanut butter and mix quickly to incorporate evenly. 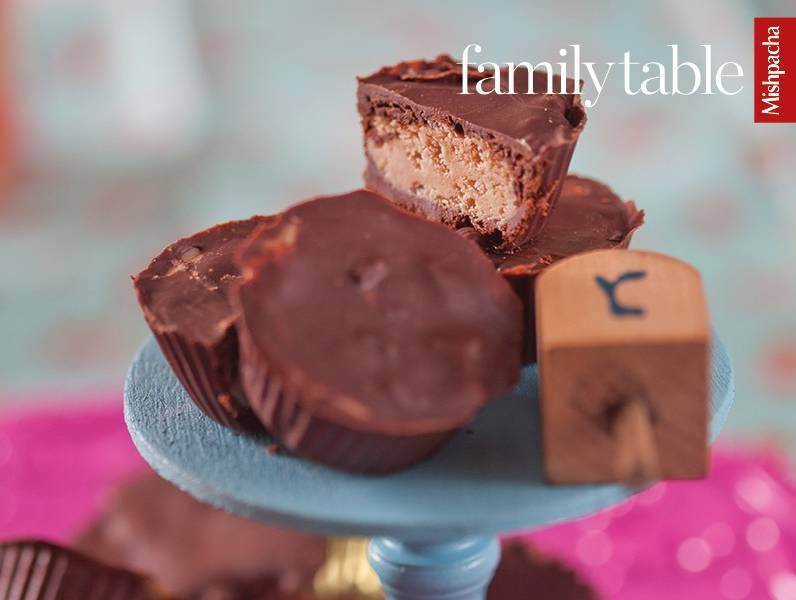 Pour a bit less than a teaspoon onto the chocolate in each cup, and smooth down with the back of a spoon to create an even layer. Wait until the peanut butter sets, and then repeat step one: melt the remaining bar of chocolate and pour it over the peanut butter layer, again smoothing the top with the back of a spoon. Let set completely, and then peel away cupcake paper if desired. These will keep in freezer for up to three months.